But Trump got them out . What more do you want? It's your boy tRump who wants a lot more apple polishing. Saying "thanks" wasn't enough. Your candidate lost, get over it and move on. My candidate lost in the primary. 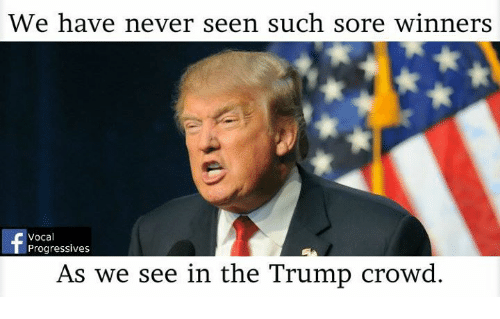 So, Trumplings have had a year to get over being sore winners, but it's still not enough time for you to settle down. And tell Franken to resign. He's a disgrace, and he wasn't even legitimately elected. That's for the good people of Minnesota to decide. But it's easy to understand why you're sensitive about him getting more votes. Pubs tend to "win" w/o a majority. But feel free to whine about it some more. Last edited by Old Gringo; 11-23-2017 at 03:09 PM..
China frees/deports tourists busted for small crimes all the time. Apparently, they don't like creating international incidents over minor issues. Trump is trying to convince everybody he's a big shot, when he had little to do with this. Yup, assertion of fact with no proof whatsoever. Sure, they probably wouldn't have imprisoned them for five years, but a few months would be reasonable and expected. By the way, if you happen to get arrested in some 3rd World country while Trump's there, you'll stay true to your convictions and not ask for help, right? More like China saw an opportunity. I wonder what they got in return to free the criminals? I do not think the president should have intervened at all, unless he plans to do it for every single US citizen arrested in another country. Agree. China should have their laws and punishments respected, as they see fit.